New Art West Midlands awarded me a micro bursary to travel to Edinburgh, where the only publicly available laboratory with a genetic engineering license is currently run by ASCUS Lab. ASCUS is based at Summerhall Place, an Eighteenth Century brewery turned University Veterinary College, which today has become a hub for artistic and creative organisations involved in animation, jewellery design, theatre, print, and other visual arts. 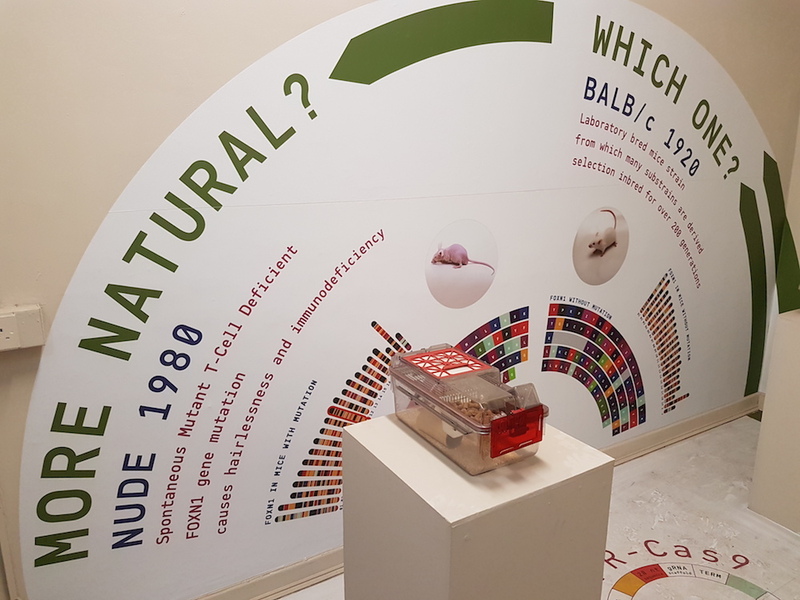 ASCUS have run events for ten years, hosting guest speakers in Summerhall’s anatomy lecture theatre; public science experiments in the old veterinary dissection room; and curated exhibitions of artists working in the fields of art and science within their own gallery spaces. 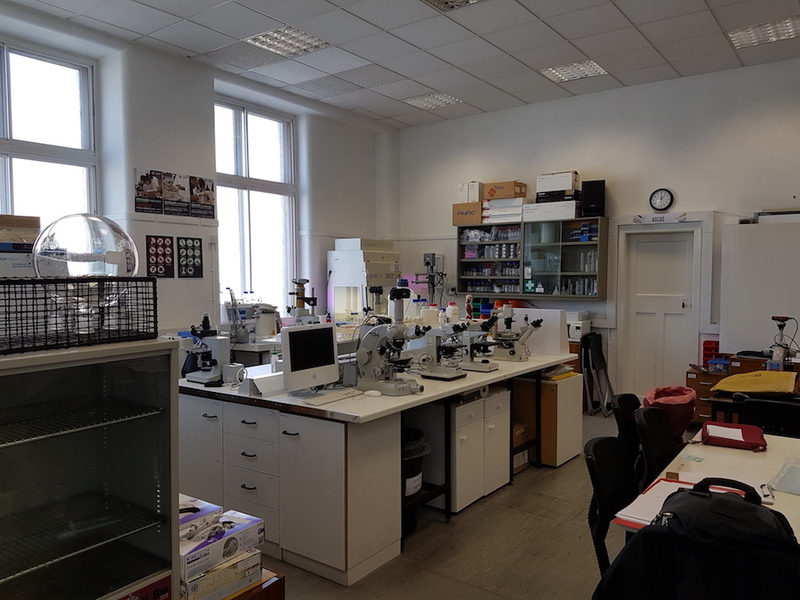 Two years ago it opened ASCUS Lab with funding from the Wellcome Institute, and since then have run open lab days Thursdays and Saturdays for artists, students, and the public to conduct their own research or experiments, with inductions in microscopy, microbiology, and DNA analysis. Since 2018 they have ran several courses and workshops including ‘The Art of Tissue Engineering’, ‘The Physics of Pigments and Paints’, and ‘Model Organisms: Making Mutants’. On my visit to Ascus Lab I met with lab technician Dr. Jiří Jirout who showed me around the lab and their equipment, donated from the University of Edinburgh. Dr. Jirout introduced me to the range microscopes they currently had set up, and the various techniques used when looking at different specimens, such as darkfield microscopy, which angles the light source beneath the specimen away from the viewing lens, illuminating the specimen whilst keeping the background blacked out. I was told about the various projects arts students from the university were working on; sculptors and illustrators viewing their work under magnification, and textile artists growing pellicles of bacteria cellulose for textile swatches. 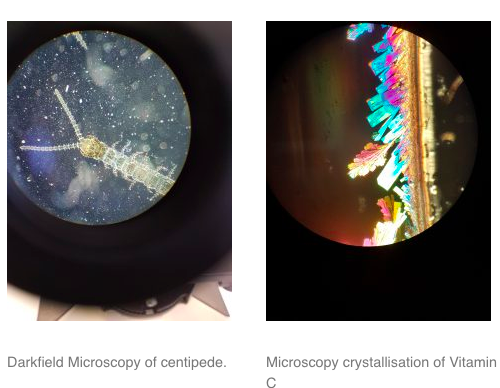 One member who had interned with ASCUS lab had grown crystals from chemicals she found in the lab; a sample of Vitamin C was on show, the forms and colouration of which was currently being used as inspiration in a new work by members and visitors. The first room I entered held on display in a cabinet The Pig Wings Project (2000) by Oran Catts and Ionat Zurr. 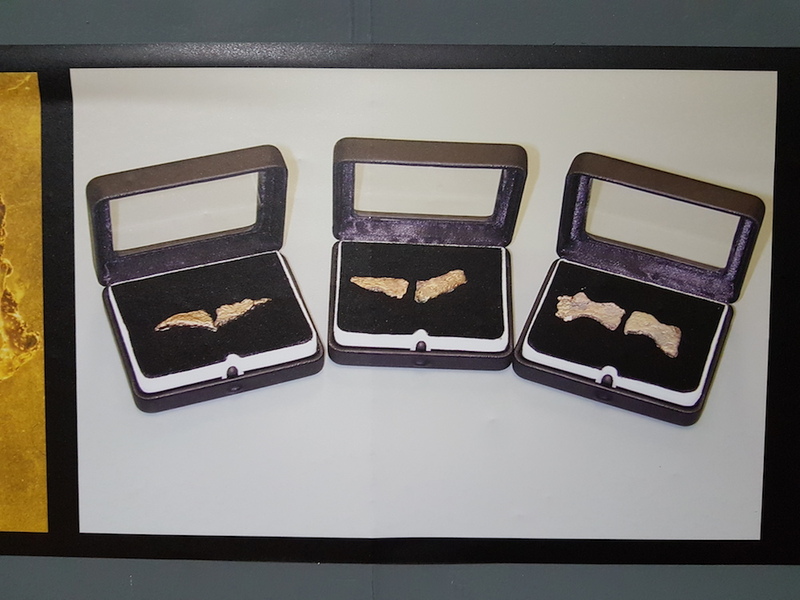 The work consists of three variations of wing design – seemingly mammalian (bat), aviary (bird) and reptilian (pterodactyl) – which have been grown using cells harvested from pig tissue – the first ever of their kind. For me the title of the project plays on the phrase “when pigs fly”, relating to a concept that will never happen or come to fruition, yet here it has happened. The project demonstrates that we now live in a time where humans have mastery over cells themselves, something which in previous decades would have never been thought possible. It also hints towards the use that pig cells have for humankind. Biological material from pigs used in xenotransplantation surgeries, pig heart valves to replace damaged human ones, and pig to human blood transfusions, are all possible due to the evolutionary similarity and inheritance homo sapiens share with the sus genus, or pig family tree. Very small and delicate in appearance, these organic models appear almost embryonic, as if hinting at the shape of things to come within the future of human animal hybrids. Crossing Kingdoms (2018-) sees Oran Catts and Ionat Zurr in collaboration with Tarsh Bates on the pig wings project’s spiritual successor, which looks at how not only mammalian cells from pigs may be fused with human ones, but cells from entirely different kingdoms of life. “The work raises questions, through actual manipulation of life forms, about the practical and ontological nature and identity of novel organisms that fall outside of scientific and cultural classification systems”. The moral questions concerning this kind of research are some of the greatest we now find ourselves responsible to answer, and what Catts, Zurr, and Bates have done is taken that research out of the lab and put it on public display, forcing us to begin having those conversations in open spaces. ‘P’eng’s Journey to the Southern Darkness’ (2016) Ting-Tong Chang. Across the hall in a second room is an installation of works by Ting-Tong Chang, titled P’eng’s Journey to the Southern Darkness (2016). The work opens up with a video interview between the artist and Simon Schaffer, professor of History of Science at the University of Cambridge. Schaffer has written on, and appeared in documentaries which examine the history of automata, and humans relationships to them. Schaffer looks at the robotic works by Chang as artefacts which not only entertain and intrigue us, but also offer a mirror to us about how we as a species deal with perceived intelligences. In the wake of artificial intelligence, the work begins to ask us how we feel about a possible future where humans share the planet with an intelligence equal to, or greater, than our own. In the adjacent room four taxidermy crows sit atop plinths of increasing size. They audibly click as they bow their heads and raise their folded wings, constantly drawing your attention to them as they move into new positions out of the corner of your eye. Playing through a speaker a robotic voice reads aloud emails and letters of rejection addressed to the artist from open calls to exhibitions for his work. 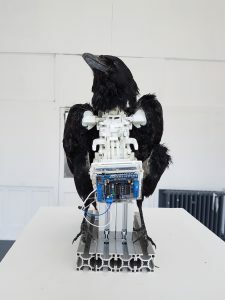 Chang explains that “the number and type of bird signify death in Chinese traditions…” and announced failures “…playfully question the proliferating bureaucratic art world in which contemporary artists find themselves in.” The fact that the circuitry which animates these crows is so obviously on show is a testament then to how easily it is still to rouse suspicion in the mind of its human viewer, is it alive, dead, or somewhere in between? The darting movements and nods of the head still evoke a fascination, and fear, of what this ‘living’ creature might do next, or where it sits in our understanding of the natural world. The fusion here of nature and machine points not only to the death of such binary terms; natural, artificial; living, dead; but of a rebirth of the two, not speculative but happening right now, in bionics and synthetic lifeforms. ‘Truly Natural’, Marta de Menezes. Contributing to this dialogue is the work found in a brief retrospective of Marta de Menezes, in the piece Truly Natural. “The society of today is increasingly concerned with the distinction between what is natural and what is modified…However, as human creativity has been developing increasingly powerful tools to control nature, it is becoming difficult to discriminate the natural and the artificial”. On display are two houses for mice, one which has supposedly been genetically altered, and one in which a genetically altered mouse has had the modification undone, thus becoming ’natural’ again. This work evokes the many moral dilemmas which persist in the minds of the public concerning genetic modification, and which become the narratives of some of the most enduring and vivid novels, films, and artworks dealing with genetic modification technology, such as Frankenstein, Blade Runner, and GATTACA. The issue then presents itself, how do we discern what is real, and what has been made/altered? This fear is rooted in a long history of human storytelling which reinforces the idea that what is natural is inherently good, and what is artificial is inherently bad, handed down from biblical parables to contemporary news headlines. However, we live in a world built on artifice of our own making; animals and plants selectively bred, landscapes urban and rural shaped to our own needs, and virtual environments where humans can lose themselves in. Menezes’ work reflects these truths back to us. Dolly, National Museum of Scotland. 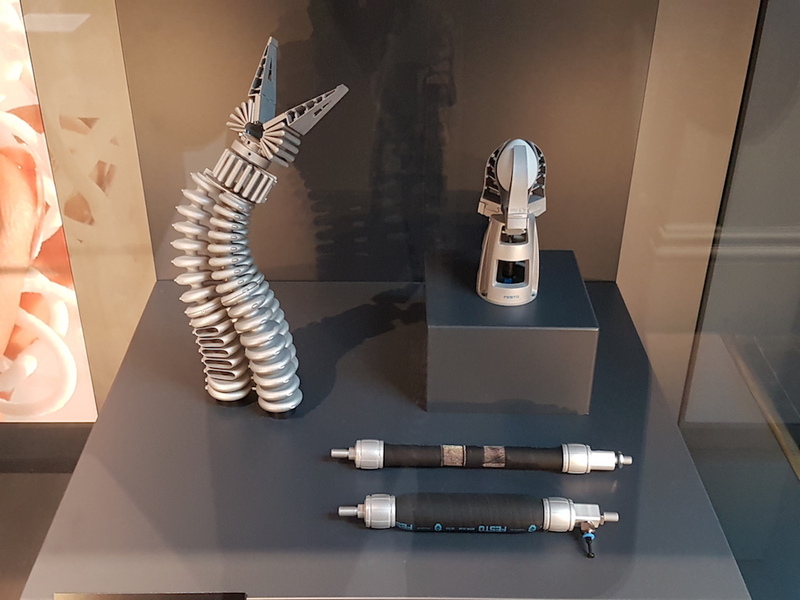 The creativity of human engineering and the blurring distinctions between the natural and artificial is apparent when you visit the National Museum of Scotland. 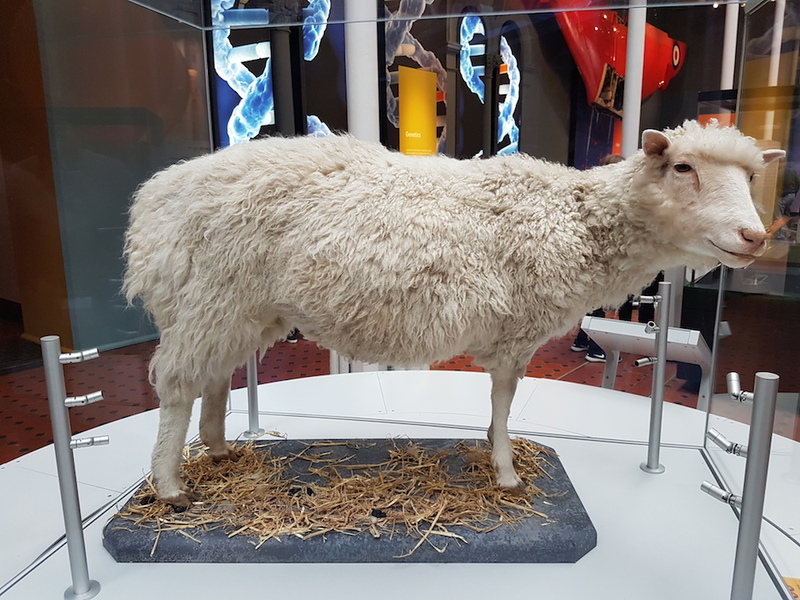 There, behind plexiglass, in an artificial environment complete with natural hay and sheep droppings, is Dolly, the first ever cloned mammal. Dolly the Sheep was my first introduction to bioethical debates around genetic engineering. For me, Dolly became the root of my interest around the real and the artificial, about whether such distinctions mattered anymore, whether we needed the artificial because we had already destroyed the possibility of the natural to survive. Years later, I found about a group of transgenic goats, known as spider goats, because their genome contained a gene from a spider which meant that the goats could have spider silk extracted from their milk. The image of such a creature conjures in the mind an eight legged mutant goat, but the spider goats look like any other ‘natural’ (domestic not wild, thereby not truly natural) goat. Images on the internet of spider goats do sometimes have pictures of eight legged goats with the sensationalist captions we expect to see from news headlines. However, these are natural mutations, parasitic twins. Is it then a moral responsibility to use genetic modification to undo the damage that natural biological mechanisms cause? Historically we know that humans have used such arguments to commit atrocities in the name of eugenics, and how this technology could be used in future is definitely a concern. What I believe these artists are doing by taking the work of biologists and scientists out of the lab and into the gallery is to engage the world, through novel, political, and beautiful artefact, so that everybody may have the chance to understand, discuss, and voice their opinion on its use. Companies like FESTO are demonstrating the value of this collaboration, using mechanisms from nature, such as the maneuverability of the elephants trunk, to help designers find new ways of automating everyday tasks in factories and workplaces, “safe and efficient human-robot collaboration”. The rate of innovation in these collaborative fields is unlikely to slow down, and with technologies such as 3D printing now starting to print biological material, the next industrial revolution seems set to be biological.